I guess no one can live without friends. Who would have thought that I'll meet these gorgeous ladies online? I met some of them at our digi-scrapbooking forum while others at Twitter. Some of my friends have friends that also became my friends and now our group expanded already. 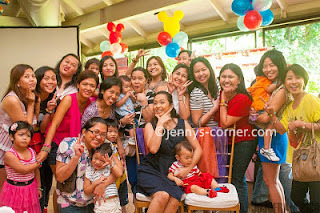 Our very first EB/ get-together was on Feb. 2007 and soon after that we meet every now and then on lunch, birthdays, Christmas parties, movie date and more. I'm so lucky to have met them!